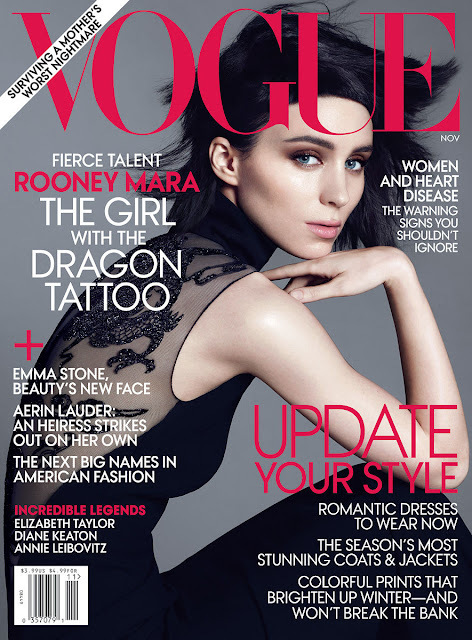 The 'Girl with the Dragon Tattoo' actress Rooney Mara covers the November Issue of Vogue USA. The cover was shot by Mert Alas and Marcus Piggot. The first film in the Millennium Series: 'Girl with the Dragon Tattoo' is out in December, starring Mara and Daniel Craig. I am love love loving the cover, very chic. The dragon embroidered Ralph Lauren is a bit literal, but Mara looks tres amazing. 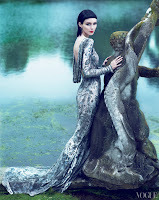 The spread below features Mara in looks by Marchesa, Alexander Wang, Vera Wang, Bottega Veneta and Calvin Klein. Great editorial spread from Vogue USA, a definite favourite.